An Avatar /ˈævətɑr/ (Hindustani: [əʋˈt̪aːr], from Sanskrit अवतार avatāra "descent"), in Hinduism, is a deliberate descent of a deity to Earth, or a descent of the Supreme Being (e.g., Vishnu for Vaishnavites). The word is often translated into English as "incarnation", but more accurately as "appearance" or "manifestation". The term Avatar has also become widely applied in computing as a graphical representation of a user or a user's alter ego or character, within a realm of cyberspace. The Avatar appears in different forms, under different names, at different times, in different parts of the world. As his appearance always coincides with the spiritual birth of man, so the period immediately preceding his manifestation is always one in which humanity suffers from the pangs of the approaching birth. Whether there have been 26 Avatars since Adam, or 124,000 Prophets, as is sometimes claimed, or whether Jesus Christ was the last and only Messiah, or Muhammad the last Prophet, is all immaterial and insignificant when eternity and reality are under consideration. It matters very little to dispute whether there have been ten or twenty-six or a million Avatars. 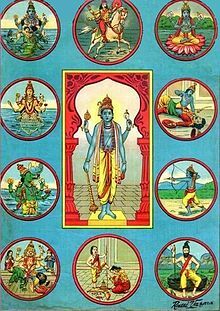 The truth is that the Avatar is always one and the same, and that the five Sadgurus bring about the advent of the Avatar on earth. This has been going on cycle after cycle, and millions of such cycles must have passed by, and will continue to pass by, without affecting eternity in the least. Irrespective of doubts and convictions, and for the Infinite Love I bear for one and all, I continue to come as the Avatar, to be judged time and again by humanity in its ignorance, in order to help man distinguish the Real from the false. When I say I am the Avatar, there are a few who feel happy, some who feel shocked, and many who hearing me claim this, would take me for a hypocrite, a fraud, a supreme egoist, or just mad. If I were to say every one of you is an Avatar, a few would be tickled, and many would consider it a blasphemy or a joke. The fact that God being One, Indivisible and equally in us all, we can be nought else but one, is too much for the duality-conscious mind to accept. Yet each of us is what the other is. I know I am the Avatar in every sense of the word, and that each one of you is an Avatar in one sense or the other. It is an unalterable and universally recognized fact since time immemorial that God knows everything. God does everything, and that nothing happens but by the Will of God. Therefore it is God who makes me say I am the Avatar, and that each one of you is an Avatar. Again, it is He Who is tickled through some, and through others is shocked. It is God Who acts, and God Who reacts. It is He Who scoffs, and He Who responds. He is the Creator, the Producer, the Actor and the Audience in His own Divine Play.